Opening hours: Most shops operate between 9am and 6pm, from Monday to Saturday (closing on Sundays). For restaurants and other businesses, hours may vary. Wandering the old town streets and admiring the Flemish renaissance architecture might be one of the greatest pleasures the city has to offer, but together with a handful of solid art museums, excellent shopping and hearty, scrumptious cuisine, Lille is northern France's biggest city in not only terms of size, but also cultural offerings. 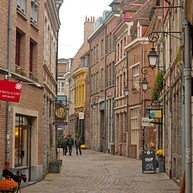 Start your stay in Lille by exploring the old part of town and wandering along Vieux-Lille's cobbled streets. Apart from fine examples of old Flemish architecture, the area contains a plethora of small boutiques and cosy cafes. Do not miss the charming little Place aux Oignons. 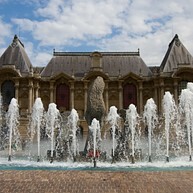 Second only to Parisian Louvre in the calibre of its collection, Lille's Fine Arts Museum (Palais des Beaux Arts) contains works by assorted great masters, the likes of Rubens and Manet. The basement level holds archaeological finds and miniature representations of the region's 18th-century fortified settlements. 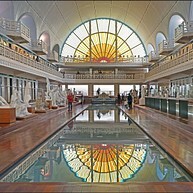 The building of what once was an Art Deco swimming pool has now been turned into a fine/applied arts museum (La Piscine Musée d'Art et d'Industrie), classical sculptures and busts lining the filled-up pool in a bizarre yet curious presentation. 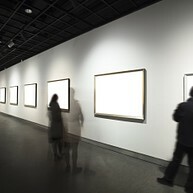 The Lille suburb of Villeneuve-d'Ascq is worth the trip if only for its singular Modern Art Museum (Musée d'Art Moderne, d'Art Contemporain et d'Art Brut – LaM), which showcases works by celebrated modernists (such as Picasso and Modigliani, to name a couple), along with a noteworthy collection of outsider art. First built in the 17th century following the seizing of Lille by French forces, the Citadel is an impressive star-shaped fortress which now houses the French Rapid Reaction Corps. Guided tours of the Citadel are held monthly. The park area surrounding the fortress contains pleasant greenery and the Lille Zoo. The building of La Vieille Bourse, as it is known locally, consists of a couple dozen separate buildings and a beautiful courtyard containing a book flea market. It is a fine example of 17th century ornamental Flemish Renaissance. Finally completed only at the turn of the current century, the Cathédrale Notre-Dame-de-la-Treille bears striking dissimilarity to Gothic and Romanesque cathedrals across Europe - perhaps, due to its pronouncedly modern facade. The inside contains a crypt and sacred art museum. Located only a short walk outside the old town, the Lille Zoo is a pleasant afternoon pastime for the whole family. Ticket prices are times lower than those at an average west European zoo, all animals are well looked after, and an impressive collection of species for a zoo of such compact size is represented. 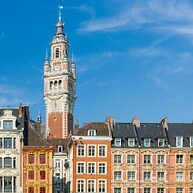 The belfry of Lille's Hôtel de Ville shoots up a hundred metres into the sky, and is accessible via both stairs and an elevator (the latter means of reaching the top is recommended). From up top, a splendid view unfolds over the entire city, including a few local landmarks (although admittedly little of the old town). 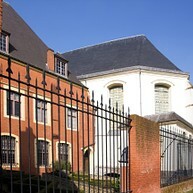 The Hospice Comtesse Museum, or Musée de l'Hospice Comtesse, is a century-old once-hospital now open to visitors. The complex consists of a former hospital hall and an adjacent chapel. The English audio guide is informative and essential for those who do not speak French.